Austrian – born Christiane came to Zambia as a nurse in the 1970s. In 1983, renowned Zimbabwe sculptor Joseph Ndandarika handed her a piece of stone and said “Work on it!” Before long, Christiane had become a full-time artist, carving springstone and serpentine. Her style gradually evolved from representational figures to more abstract shapes that evoked natural landscapes and the creatures living there. In a year-long trip to west Africa, she was impressed by local woodcarvers, and the strong relationship of both art and artists to local forests and beliefs. 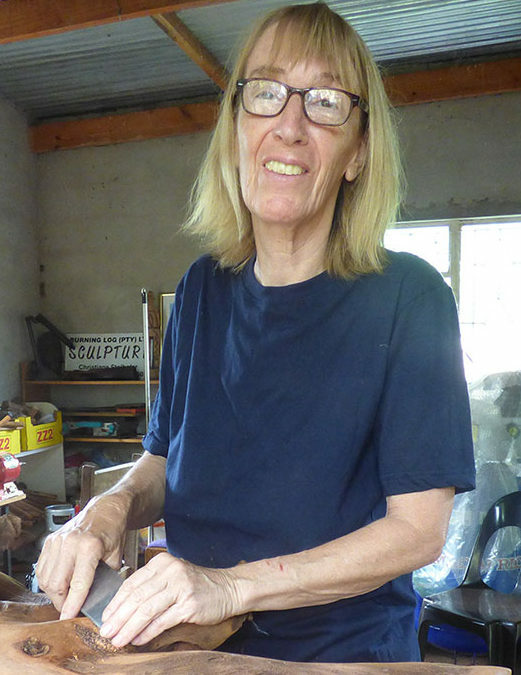 On her return to Zimbabwe, Christiane began to combine her stone pieces with local indigenous wood. She explored woodlands, learning the names of local trees, and collecting and planting their seeds. The beauty and variety of woods captured her imagination, and she moved more and more to carving fallen limbs, tree roots and posts from old farm kraals. Working in northern Botswana since 2006, Christiane’s inspiration has come from the exquisite beauty of the Okavango Delta, its clear waters surrounded by forests of Mopane trees. Mopane, with its fine, even grain and deep warm colour, has become the signature material for Christiane’s Botswana wood sculptures. Moving from stone, to wood, to precious metals, Christiane now creates limited edition miniatures of selected sculptures in African sterling silver and bronze. Download Christiane’s Curriculum Vitae here.